Teething and congestion may occur at the same time, but it doesn't mean the former causes the latter. In fact, congestion is not a symptom associated with teething, according to the American Academy of Pediatrics. There may be an indirect relationship between the two, however, as babies often chew on toys to ease the discomfort of teething, and this is a good way to pick up germs that might cause congestion. Babies usually start teething between the ages of 4 and 7 months, and continue to teeth until about 24 months of age. As the teeth push their way through tender gums, a baby may drool more often than normal, become fussier than usual and try to chew on things. Teething does not cause congestion, nor does it cause a high fever, diarrhea or general malaise. In fact, attributing a high fever or prolonged crying to teething pain can be dangerous to a baby's health as it can delay the diagnosis of a more serious infection, according to the AAP. 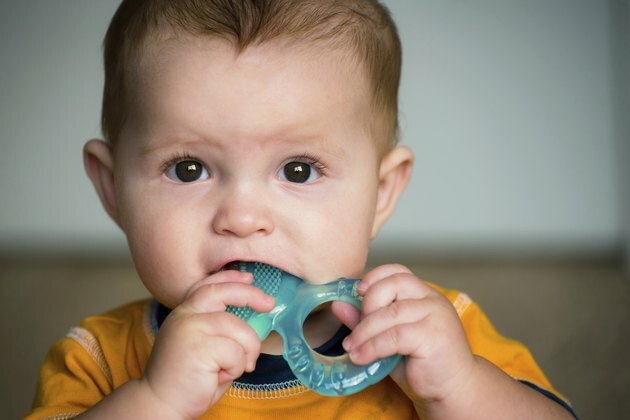 Parents can help ease the discomfort of teething by providing the baby with something hard and cool to chew on, such as a rubber teething ring. Cool teething rings and other items in the refridgerator, not the freezer. Putting pressure on your baby's gums with your finger can also help, but resist the urge to dab your finger with a bit of pain-relieving gel. Not only are topical oral medications ineffective on babies, they also pose a health risk if the baby swallows excessive amounts of the gel, according to the AAP. Babies -- especially those under 2 months old -- breathe primarily through their noses, according the University of Minnesota Medical Center. And when that nose becomes congested, the baby will become fussy, unable to sleep and may have trouble feeding. If your baby is congested, it was likely caused by a cold, the flu, allergies or a sinus infection -- not teething. Keep germs away from your baby by making sure shared toys are cleaned and sterilized between uses, and by washing his hands frequently as babies who are teething often chew on their own fists and fingers. To help a congested baby breathe easier, sit her upright whenever possible. Since babies can't blow their own noses, clear your baby's nose with a nasal aspirator. Lubricate the nasal passages first by gently spraying warm saline water in the nostril, which will loosen the mucus. A cool mist vaporizer in your baby's room will help, and if your baby is really fussy, try sitting with her in a small bathroom with the shower running on hot -- the warm steam will soothe the baby and help clear out her congested nose. Never give a baby over-the-counter decongestants. If your baby is teething, congested or both, watch her for warning signs that may indicate a trip to the doctor is needed. Pulling on the ears, rapid breathing, a fever more than 100.4 degrees Fahrenheit, a reduced appetite or yellow or green mucus are all reasons to contact your pediatrician immediately.